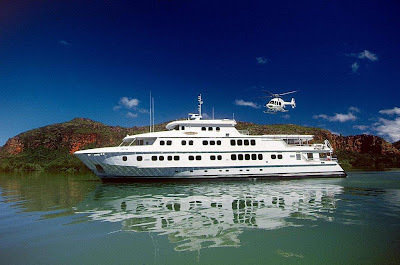 BROOME - Luxury adventure cruise ship True North will commence its 2009 Kimberley Wilderness Cruise season in March. True North is a purpose-built ship for the Kimberley coast and river systems. North Star Cruises Australia general manager Peter Trembath said with heavy monsoonal rains, the Kimberley was being transformed by rivers in flood, towering waterfalls and an abundance of wildlife. North Star offers a range of Kimberley Wilderness Cruises starting March 14 with a 13-night trip from Broome to Wyndham. Kimberley Wilderness Cruises also traverse the coastline between Wyndham and Hunter River, and from Hunter River to Broome. In all, 17 departures ranging in length from 6/7 nights to 13 nights are scheduled throughout the 2009 Kimberley season, which concludes in mid September. True North’s multiple expedition boats allow passengers to do “what they want, when they want”. It is also the only Kimberley adventure-cruise ship that sails with its own helicopter. Kimberley Wilderness Cruise prices start from A$9,495 for a 6/7 night cruise.